Craving a longer swimming season? A great way to achieve this is with a solar thermal heating system. 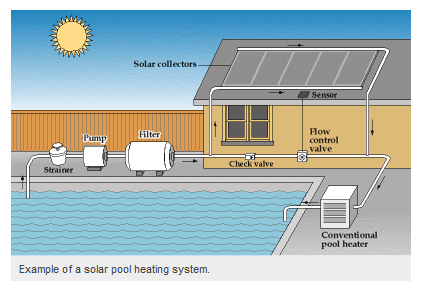 Not only can you keep the pool feeling warmer for 2-4 weeks longer, but your summer electric bills won’t skyrocket! Plus, utilizing the power of the sun doesn’t create any pollution or greenhouse gases like conventional electricity generation. Other benefits of solar equipment include: less required maintenance, longer lasting and comparable upfront costs as gas or electric pool heaters. Ahere to local building codes and regulations.